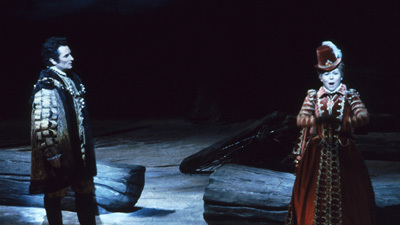 There have always been bitter rivalries between fathers and sons, but the tension between King Philip II of Spain (Giorgio Tozzi) and his heir Don Carlo (Franco Corelli) reaches new levels in Verdi’s magnificent opera. Leonie Rysanek is electrifying as Elisabeth of Valois, promised to Don Carlo but suddenly married to Philip instead. Irene Dalis is the beautiful but treacherous Princess Eboli who wants Don Carlo, even though she is his father’s mistress. With Hermann Uhde as the menacing Grand Inquisitor.